Looking to snap up some new peripherals? Need something that matches your extreme battle royale-infused lifestyle and not just any headset or mouse will do? SteelSeries has the answer for you, and it's dripping with awesome, that is, if you're a huge PUBG fan, anyway. SteelSeries has just announced a new collaboration with PlayerUnknown's Battlegrounds, with selection of various computer peripherals up for grabs including a headset, keyboard mouse, and mousepad to help keep you looking cool and feeling cool while trying to track down that coveted chicken dinner. You know you spend a ton of time trying to earn that coveted reward, so why not share it with the world? 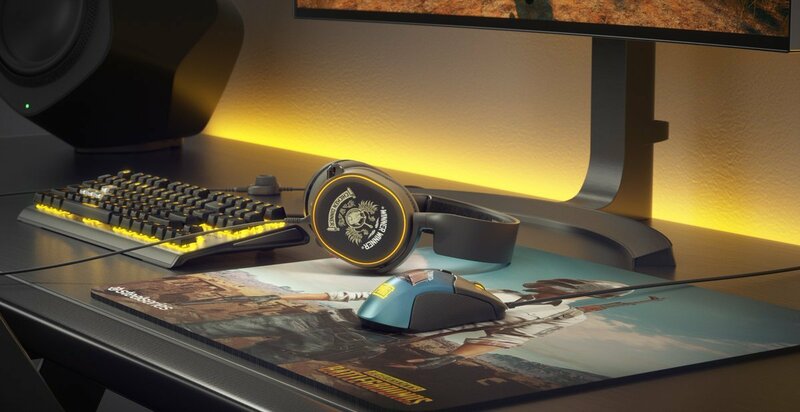 These officially-branded products include the Arctic 5 PUBG Edition headset, the Apex M750 TKL PUBG Edition keyboard, the Rival 310 PUBG Edition mouse, and the QcK+ PUBG Miramar Edition mousepad. The set will be available starting this September, with prices ranging from $19.99 to $129.99. They're not particularly attractive, but SteelSeries makes great products, and there's a lot of good hardware here if you're looking to switch things up in your current routine. It's just too bad that the headset had to go ahead and actually use the "winner winner" slogan on it. That's just going a little too hard. Overall the article and especially the news is cheering me up. Thanks for the wonderful write-up, Brittany.